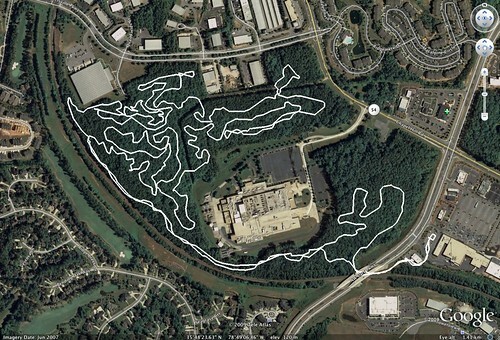 Mountain biking in Morrisville - To grrr, or not to grrr? That is the question. swindunbar arranged for us to do some mountain biking in Morrisville. I have not been there in probably a year or two and I'm impressed that these have matured. Last time I was there my dad fell on one of the drops, but no permanent damage. Glad we went early as it was going to be hot and muggy today. I kept my pace down a bit since it's been like 2 weeks since I've been out. Did a lovely trail yesterday. 3.4 miles and did it 4 times in about an hour. It was the first time I've 1. done it 4 times in a row and 2. done it without stopping once to rest (technically I pied once but don't count that LOL).